Metals - when exposed to oxygen and water - will oxidise. This is a fact of life, as any chemistry student will know. Air is 20% oxygen and 1% water vapour so there is no escaping this even in a dry spell. The only unknown factor is time. Fortunately, copper based alloys (like brass and bronze) do not rust like steel and iron. Instead, the surface oxidises to form a natural patina which protects the metal against corrosion. Therefore, metals - particularly those situated outside - need care. You wouldn't buy a car and never inflate the tyres or change the oil - it would soon become unusable. Architectural ironmongery should be treated with the same respect. 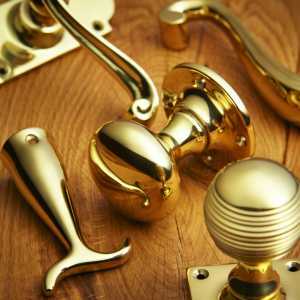 BRASS: products listed as this are made from solid brass and are polished (unless otherwise stated). Brass - lacquered; after polishing, the brass is coated in a clear acrylic lacquer. This process protects the finish from oxidising and removes the need for regular polishing. Over time, the lacquer will break down and need to be stripped. After this the brass will need to be cleaned with a metal polish to maintain the golden appearance. However, it is perfectly possible to leave the brass as it is, but it will not look as shiny and new as it once did. We do not recommend lacquered brass for coastal areas. Brass - unlacquered; an increasing number of products in our range are now available without lacquer. 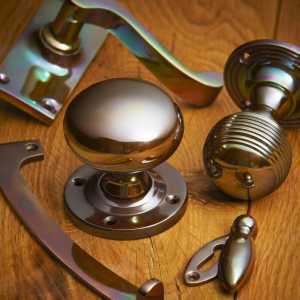 These products are brass in it's natural form and they can be left to age or be polished as and when needed. For coastal areas or period properties, we would recommend unlacquered brass. STAINLESS BRASS (P.V.D. ): this finish looks like bright polished brass but is both scratch and weather resistant. This removes the need for polishing and is particularly suitable for regions subject to excess weathering - e.g. coastal areas, areas of high pollution etc. Many of these products come with an extended guarantee. Stainless brass products only require an occasional wipe clean with a damp cloth to remove excess dirt. ANTIQUE BRASS: this is a chemical finish applied to brass to give an aged look. Antique brass products only require an occasional wipe clean with a damp cloth to remove excess dirt. They are unlacquered so can be polished to a shine if desired. CHROME: this is a highly polished mirror-like electroplated finish applied to brass (usually) or zinc alloy products. This finish is generally very durable but care should be taken not to scratch the plating as this could compromise it's integrity. Chrome plated products should only be cleaned with a damp cloth and then buffed with a wax or specialist metal polish to provide an extra layer of protection. SATIN CHROME: this is a matt electroplated finish applied to brass (usually) or zinc alloy products. This plating is generally very durable but care should be taken not to scratch the finish as this could compromise it's integrity. 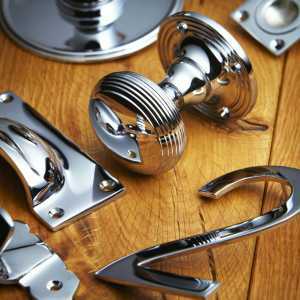 Satin chrome plated products should only be cleaned with a damp cloth and then buffed with a wax or specialist metal polish to provide an extra layer of protection. 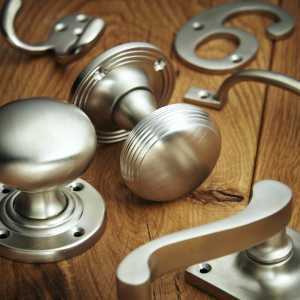 BRUSHED NICKEL: this is a brushed electroplated finish applied to brass (usually) or zinc alloy products, similar to satin chrome but with a slight grain to it. It is also a slightly darker shade of grey than satin chrome, more similar to stainless steel. This plating is generally very durable but care should be taken not to scratch the finish as this could compromise it's integrity. 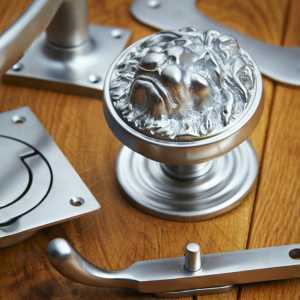 Nickel plated products should only be cleaned with a damp cloth and then buffed with a wax or specialist metal polish to provide an extra layer of protection. STAINLESS STEEL: all our stainless steel products are made from Grade 304 steel and come in a brushed finish unless otherwise stated. The occasional wipe with some WD40 or similar should be enough to maintain it's appearance. 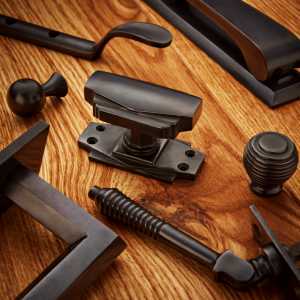 BLACK PAINTED: these are iron or steel products painted black. Available in a smooth or hammered finish. Black painted products should provide good protection to the steel or cast iron against rusting and can be touched up at any time. SOLID BRONZE: our solid bronze products come in an unlacquered antiqued finish and are all English made. This truly is the most exclusive of finishes. Solid bronze should only be cleaned with a damp cloth and then buffed with a wax polish (such as beeswax) to provide an extra layer of protection. Over time the bronze will oxidise to form a surface patina which will naturally protect the metal. This patina may develop a green tinge to it - this is perfectly natural and is a result of the high copper content (around 65%) of the alloy. APPLIED BRONZE: our applied bronze products come in an antiqued finish. This is a chemical finish applied to brass which is then lacquered to give a similar appearance to solid bronze but at a lower price. These products tend to be a slightly darker in colour than solid bronze. Applied bronze finished products should only be cleaned with a damp cloth and then buffed with a wax polish (such as beeswax) to provide an extra layer of protection. Care should be taken not to scratch the finish.